Here’s my 2013 Tomato Experience so far, with the caveat that I’m only growing one or two plants of each variety, and anything can happen to one or two plants, so it’s far from a proper trial. I think I can summarize with: early blight like wow, but still not a bad harvest. If I’d known about the perfect conditions for early blight ahead of time, I would have sprayed with copper fungicide (I usually don’t bother). But of course the point of weather is that you don’t know about it ahead of time. It’s been a lovely summer otherwise. New find of the year: Orange Icicle. You can see a couple of these elongated orange fruits in the photo. I’ve got one plant in the community garden and one at the demo garden; they’re both surviving and producing regularly; the fruits are thick-walled and sweet, and would probably make decent sauce if I had more plants, but they make such good fresh eating I don’t know if I’d bother, even for orange pasta sauce. 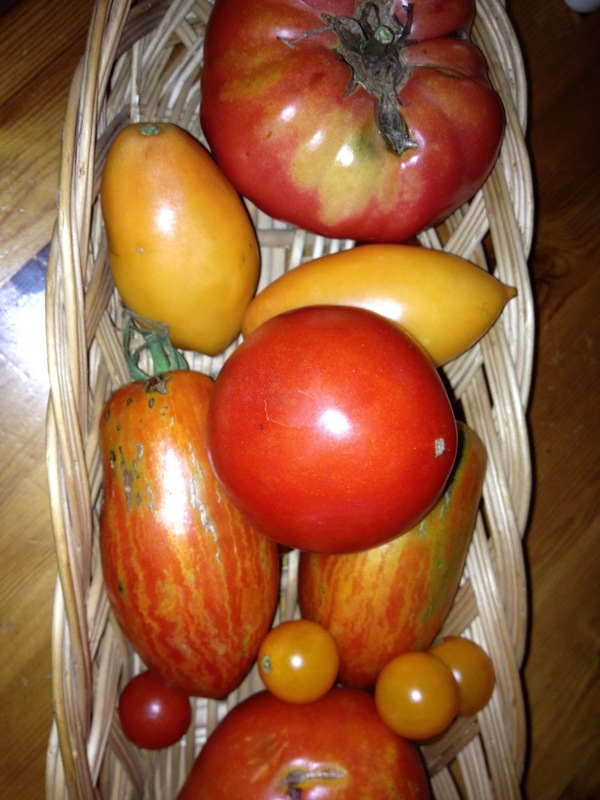 My other sweet orange tomato is the ever-delicious Sun Gold cherry, whose only fault is splitting. I mean, with the rains we’ve been having, sometimes I go to pick and they are ALL split, which means a lot of stuffing orangey goodness into my mouth in the middle of the garden, but not much left for the salads. The other cherry I’m growing doesn’t have a name; I call it Janet’s Cherry after the MG friend who gave me the seeds. If you’ve been to a MoCo MG talk on seed saving, you may have a little packet of these seeds too. They’re pretty standard red cherries with a good average taste, but the best thing about them is that unlike Sun Gold they hardly ever split, and yet aren’t unpleasantly thick-walled. I’ll be saving seeds from these and passing them on. Mortgage Lifter (top of the photo) has been a reliable heirloom for me this year. Average production and great taste. My other large-size tomato is Abruzzo (my husband brought seeds for this home from Italy last year); it’s been very slow to ripen and now the stink bugs are getting to the fruits. I don’t have a lot of stink bugs in my community garden plot, but half of the ones I’ve seen seem to be on these tomatoes, even when they are just starting to blush (which is when I pick my tomatoes now). I was given two plants of Iron Lady, a Cornell development supposed to be highly disease-resistant. As you can see by the photo, it’s far from completely resistant to early blight, though both plants in their separate gardens held out longer than their neighbors. It’s a determinate plant, so growth stopped at about the same time disease hit. Fruit has been very slow to ripen, and tastes only average when it does. Other disappointments include Big Mama (though this sauce tomato works well for everyone else, so probably I just had an unlucky plant) and Tropic VFN, which is also supposed to be disease resistant and isn’t, in either of my gardens, plus grew at half the rate of plants around it. Supersauce is dying but produced lovely large elongated fruits for a while; Pompeii at the demo garden looks healthy and productive but I haven’t had a chance to taste it yet. Speckled (aka Striped) Roman (striped fruits in the middle of the above photo) is still reliable and pretty, though I’ve seen more scars and catfacing on the fruits this year. Violet Jasper (at the demo garden) is also successful and lovely-looking. And that’s all I can recall at the moment, but tomorrow we are having a tomato tasting at the demo garden workday, so I’ll take some photos and provide an update on what I liked. 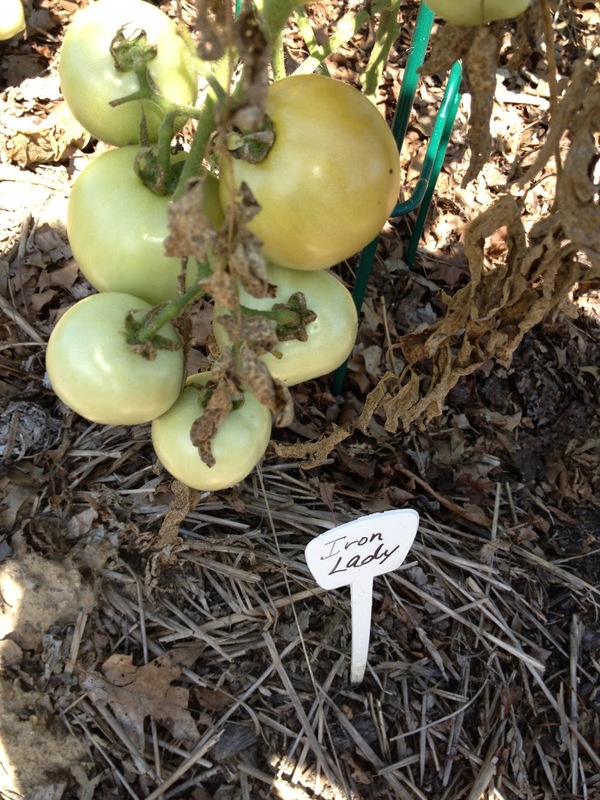 Please share about the tomatoes that have done best (and worst) for you this year, in the comments! Big Mama: seriously susceptible to early blight. I did do some spraying with copper and the plants are still hanging on for dear live. Not a pretty picture. Taste is so-so, but very little blossom end rot. Gilberti (paste): amazingly slow to ripe, lots of blossom end rot, but great taste, it looks happy and full of green tomatoes. Celebrity Hybrid. Just okay, also got infected with early blight. Juliet: doing great! Also great taste. Big Rainbow: doing amazingly well. Plant is huge, slow to ripen. Taste is somewhat watered down, but I am impressed with the heirloom. Erica, I'm going to photo and do a whole post on the paste and slicing tomatoes I've got, partly because I was sent three grafted plants to trial and feel as though I owe the company a proper post on them along with pics. However, I've got four cherry tomato plants I highly recommend for any gardener — they are great either in containers or the garden, start producing early, are pretty tough, productive and delicious, and different from each other — variety is the spice of life. My several-years favorite cherry, Sungold, has split some this year when I've left them on the plant slightly too long, but if you pick them just-ripe instead of dead-ripe, they hold well and make great snacks. Lemon drop cherry tomatoes, which I planted several years ago, have happily reseeded themselves in the same spot every year, and because the plants grew later than the ones I started in the greenhouse and planted out, they that had no early blight, look great now and are producing beautifully. The tomatoes are tart-sweet. Yummy. Mighty Sweet grape tomatoes started to produce well early (I think I picked and sauteed the first ones in late May), and are still going. This year I tried Sunchocula and would definitely grow it again — and recommend it. It's exactly as advertised in Burpee's blurb (wh is always nice) — smoky sweet, productive and delicious whether in the garden off the plant, in a salad or thrown into a pan with some fish and onions and herbs. Gosh I love summer's ingredients! My success was similar. The speckled Roman, Juliet, and sweet 100 cherry tomato have had tremendous success. My family groans when I bring in another dishpan full from 3 plants. My Cherokee purple, Johnny's Select seeds Pink Beauty, and a Patio tomato were disasters. On to the fall garlic and spinach!